US President Donald Trump is ready to give everything he promised to North Korea should the communist state faithfully implement its denuclearization steps, South Korean President Moon Jae-in has said. Moon said Trump asked him to relay such a message to North Korean leader Kim Jong-un in their summit held Friday on the sidelines of the Group of 20 meeting in Argentina. "And the message was that President Trump has a very friendly view of Chairman Kim and that he likes him, and so he wishes Chairman Kim would implement the rest of their agreement and that he would make what Chairman Kim wants come true," Moon said while meeting with reporters aboard Air Force One en route to New Zealand. Trump has agreed to meet Kim again, but no exact date has yet been set amid suspicions of a possible dispute over early rewards or corresponding measures in return for the North's denuclearization steps. In their Friday meeting, Moon and Trump agreed on the need to maintain existing sanctions against North Korea until the communist state completely denuclearizes, Moon's presidential office Cheong Wa Dae said earlier. The South Korean president said corresponding measures did not necessarily have to be a removal or reduction of sanctions. "Corresponding measures may not only mean a reduction or removal of sanctions, but may be a delay or reduction of a South Korea-US military exercise, humanitarian assistance or even non-political exchanges, such as sports and cultural exchanges," said Moon. When asked about the possibility of Kim's trip to Seoul before the year's end, the president said it may still be possible, and that it depends only on Kim. Kim earlier agreed to visit the South Korean capital to reciprocate Moon's trip to Pyongyang in September for their third bilateral summit. However, many have suspected the fourth Moon-Kim summit may be delayed at least until after the second North Korea-US summit, widely expected to be held early next year. Moon said he and Trump have not only agreed on the possibility of an inter-Korean summit before the proposed US-North Korea summit, but also that Kim's trip to Seoul would help create fresh momentum for efforts to denuclearize the Korean Peninsula. "There had been concerns that his reciprocal visit before a summit or high-level talks between the North and the US may act as a strain, but I can tell you such concerns have disappeared after my meeting with President Trump," he added. Kim's visit, if made, may also show his willingness to denuclearize, Moon noted. "Chairman Kim's Seoul visit will have significant meaning in itself," the president said, noting Kim will be the first North Korean leader to visit the South Korean capital at least since the end of the 1950-53 Korean War. "I believe Kim's Seoul visit itself will be a peaceful message to the world, and also a message of his commitment to denuclearization, commitment to the development of inter-Korean relations," he added. 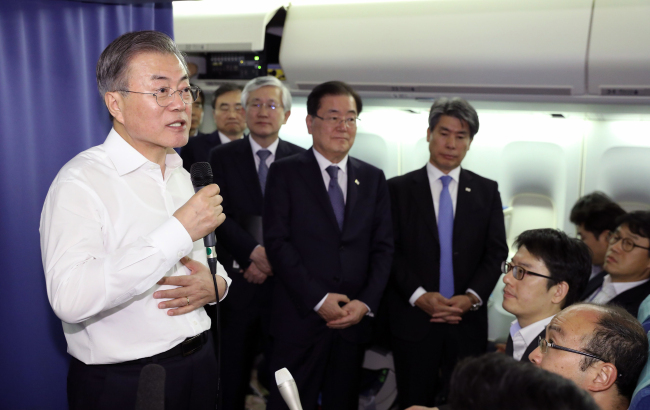 Still, the South Korean president emphasized the need to hold a second US-North Korea summit at an early date, noting the North's denuclearization process must ultimately be discussed between the two. "We do try to play a role by offering our views and trying to mediate when negotiation hits a stumbling block, but I believe it is an issue that basically needs to be resolved between the North and the US," Moon said.